New technology, in the PC world, seems to come along with regular monotony and trying to sort the wheat from the chaff is not always easy. I remember the hype surrounding the implementation of SATA3 6GBs technology and the disappointment upon discovering that standard platter HDD’s didn’t actually perform any better and to utilise the extra bandwidth you needed to be using SSD’s. 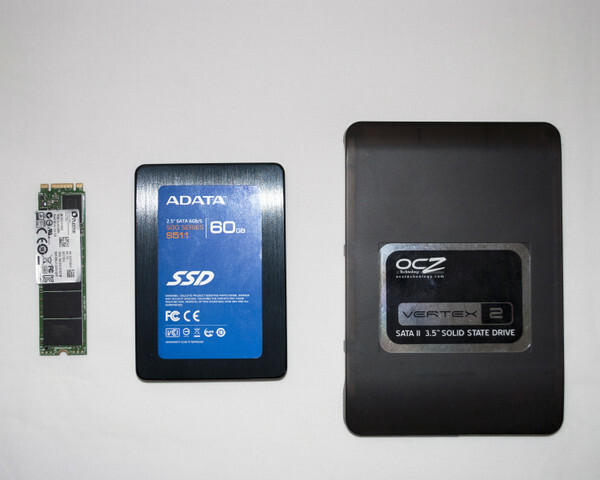 Originally, SSD’s were very expensive but know they have come down to a much more affordable price point and if you are not already using one in your system the question has to be why not? Now, with the advent of the Z97 chipset from Intel, we are offered a new technology that, on paper, offers faster speeds than could be previously achieved using the SATA protocol that is, the PCIe M2/SATA Express option that utilises the PCI bandwidth rather than a SATA controller. So, what’s different? Well for one thing, the way that these new devices are attached to the motherboard. 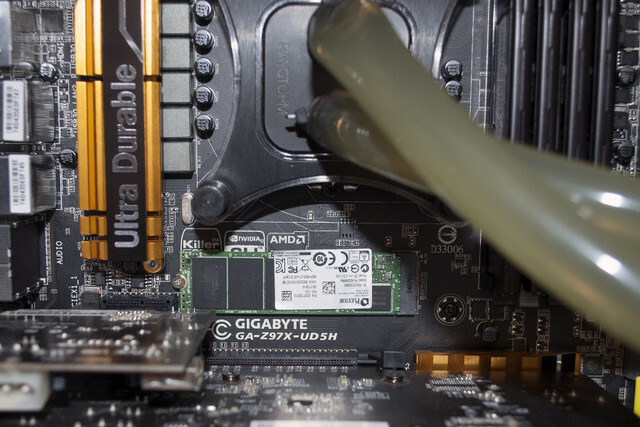 SATA Express uses a drive that is similar in looks to a standard SSD but the actual SATA Connector is different. Another method is to use an M.2 device attached to a special slot on the motherboard. Previous iterations of this technology have been around for a while and was called MSATA. But don’t let the size of this drive deceive you, for this little monster has a 256 Gb capacity. Other versions have a capacity of 128 Gb or 512 Gb. It uses the Marvell 88SS9183 IC Controller and has 512 Mb of DDR3 RAM. The amount of DDR3 RAM varies according to the size drive with the 512 Gb version using 1 Gb of RAM whilst the 128 Gb version uses 256 Mb. and is held in place by a small screw. That’s all there is to it, no extra cables cluttering up the PC case and it looks as if it is just a standard part of the motherboard. I’m not going to bore you with lots of screenshots of the BIOS or the installation of windows (If you want to know more about this aspect then check the review posted here: http://forum.giga-byte.co.uk/index.php/topic,14703.msg90963.html#new ), but I will say that the BIOS on the GA-Z97X-UD5H (F8b) recognised the drive without issue and Windows 8.1 didn’t bat an eyelid when I installed the OS onto it. If there were going to be any issues with using a device like this I would expect them to show up during this phase of the install but within 15 minutes of starting the installation I was up and running and ready to load the system drivers which, once again, was painless and very easy. 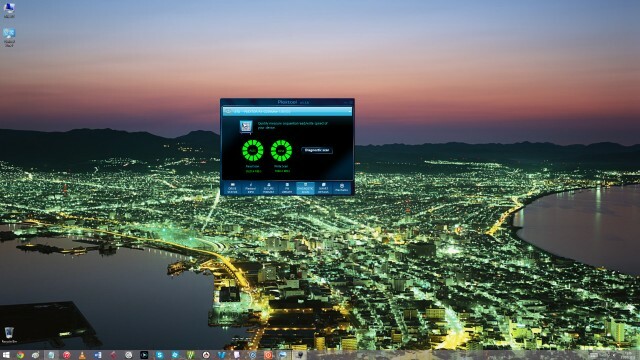 Benchmarking new technology is not an easy thing to do. This is because the software available for such tests can take some time to catch up with the technology being used. However, I know that readers of this article like to see such things so I downloaded and ran several different testing programs. The first of these was ATTO. This gave back top speed figures of 729 Mb/s for read and 572MB/s for write. I then ran the same test on a Corsair SSD attached to a SATA port on the motherboard. This returned figures of 555 MB/s for Read and 532 Mb/s for Write. So according to these tests, the Plextor M.2 PCIe SSD read speed is nearly 500% faster than a standard Hard-Drive and roughly 34% faster than the Corsair SSD, whilst the write speeds are approximately 445% faster than a standard HDD and slightly faster than the SSD. 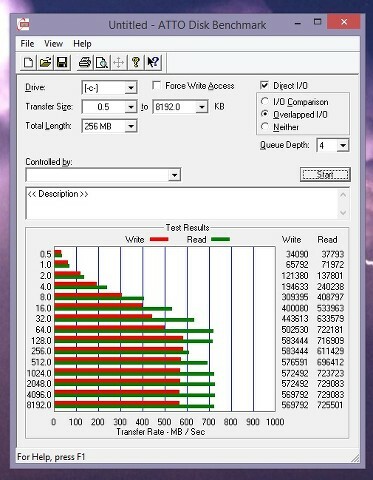 And bringing up the rear was the Western Digital HDD with figures of 115.9 Mb/s for Read and 112.1 for Write. 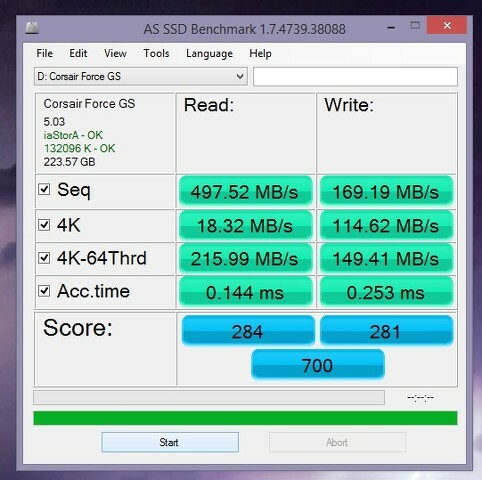 The figures for the Corsair SSD were 497.52 Mb/s for Read and 169.19 Mb/s for Write. 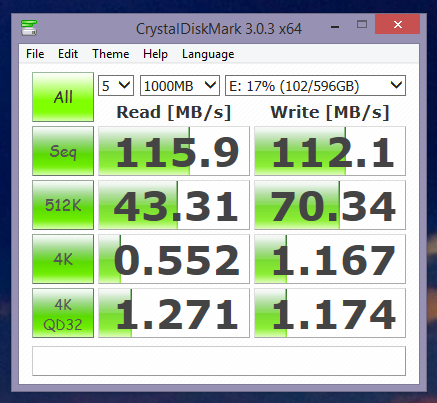 AS SSD doesn’t really like standard hard-drives so I didn’t run this test with the Western Digital drive. As you can see from these figures there is a wide range of results depending on which benchmarking software is used and this is the reason I do not like to place too much store in them. 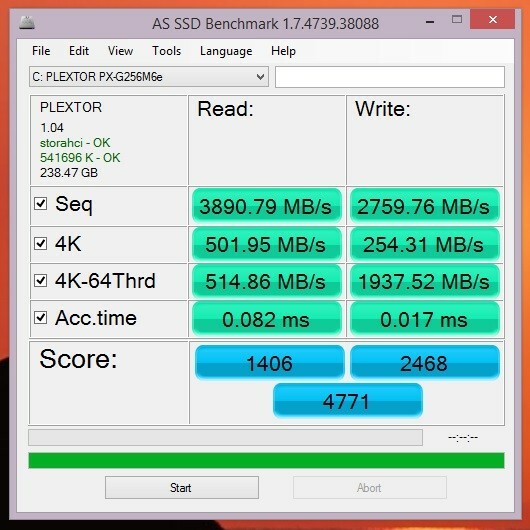 That said though, the Plextor PCIe SSD comes out on top whichever way you look at the figures. 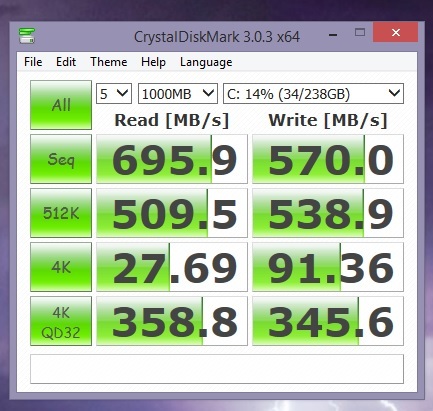 Averaging things out over the three tests the Plextor drive comes back with a read speed of 689.36 Mb/s and write speed of 561 Mb/s whilst the Corsair SSD returns average figures of 510.47 Mb/s for read and 281.96Mb/s. and the majority of this time is taken up by the Windows 8.1 OS sorting itself out. Using an old fashioned stopwatch I was actually able to get up and running using a Linux distribution in under 10 seconds. 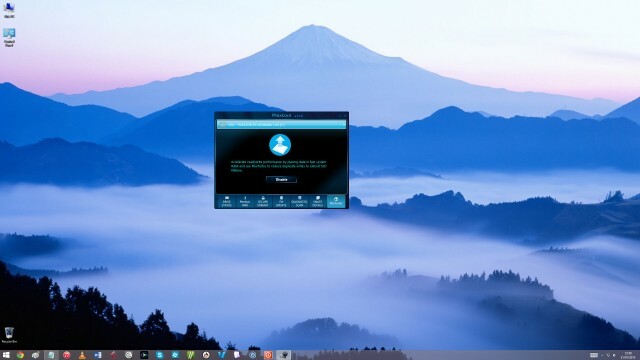 Programs such as Photoshop (I use this one quite a bit) open incredibly fast and, in fact, I can now start using this program in under 2 seconds from clicking the icon in the Taskbar. “So, what about those of us with older motherboards that don’t want to upgrade the whole system just yet?” I can hear you asking. Well, those clever guys at Plextor have also thought of this and have released a PCIe Card with one of these babies installed on it so that you can use your spare PCIe slots on your existing motherboards. 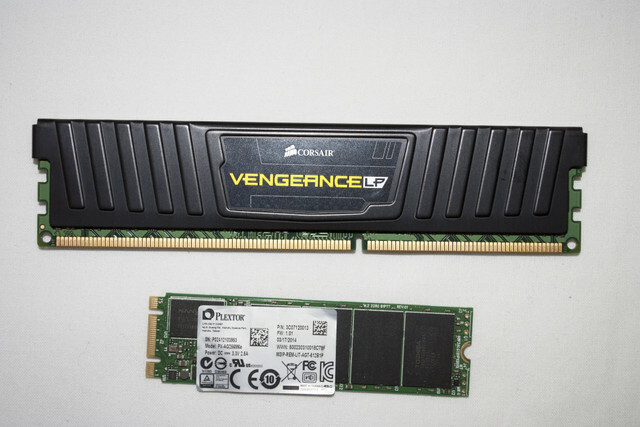 I have to admit that I haven’t tested one of these PCIe cards, but I have read several other reviews on-line about them and the results I have seen posted are equally impressive, with read/write speeds of over 1 Gb/s if you put two of them in a RAID array. Both versions of this device are now appearing on various PC supply websites with the price of the 128Gb PCIe M.2 SSD costing under £100 and the 128Gb PCIe Card version selling for around £120. If you are looking to speed up your system, but don’t want to spend too much money, then you might want to seriously consider one of these drives. In the same way that SSD’s have pushed things along then the PCIe iteration takes it to the next step. I have learnt the hard way, through an empty pocket and much frustration, that jumping on the new technology bandwagon isn’t always the best way to go and waiting for things to settle down a bit can often bear greater fruit. 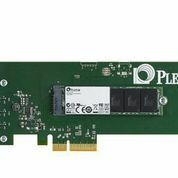 The Plextor PCIe M2 SSD isn’t one of these items and if you have the motherboard and the opportunity to get one of these drives then I would say: “Grab it with both hands”. Works like a normal Drive and utilises TRIM like a standard SSD. Thanks must go to the people at Plextor for providing the M2 PCIe SSD and also to Gigabyte Technology for the GA-Z97X-UD5H motherboard used for this test. Plextor is a world leading developer of award winning solid state drivers and other high performance digital storage devices for, professionals, consumers and enterprises.The Plextor brand of storage and multimedia products is owned by Shinano Kenshi of Japan. Thank you for your review absic, extremely informative and interesting, especially as I'm presently spec'ing my new build which will be based around the GA-Z97X-UD5H with a PCIe SSD. When testing the Plextor M6e M.2 PCIe SSD we noticed that it did get pretty warm. How warm? When running some benchmarks we found that the NAND chip on the far left side of the drive was around 40C and the label that was over the power management components was nearly 85C. The temperatures across the M.2 drive are vastly different and it was running a bit warmer than we expected it to be. Until M.2 drives are able to run cooler, however, we recommend using M.2 slots that are integrated onto a motherboard only if you are able to check the drive temperature to make sure it isn't overheating. Otherwise, we recommend using a M.2 to PCI-E adapter that includes a heatsink like the one we used in our testing. One benefit of the UD5H is that, unlike some MB's the M.2 slot is above the first graphics card slot rather than underneath it. so that should help to keep temps down. However, and unfortunately the Plextor has the controller chip on the underside of the PCB, unlike the Samsung. Obviously real world use will be slightly different to thrashing the SSD under test conditions, but do you have any experience of high temps from the SSD in daily use? My concern is that the vast difference in temps that can occur with this SSD will lead to thermal expansion problems on the PCB resulting in lower life span, as well as transferring that heat to the MB PCB at a very localised point, again resulting in thermal stress that will lower the lifespan of the MB or cause other problems such s BSOD's. interesting question and something that I have looked into after seeing the same reviews that you have linked to. All I can say is that the M.2 card I am using doesn't seem to be running hot. I can put my finger on it and it just feels about the same temperature as my SSD's. I have been using the M.2 as my C:/ drive since installation of the OS and have absolutely no issues with it at all. The only time I did notice it getting hot was when I stress tested the system in the early days, but I expected this and it never rose to a point that I was worried about it. Again it showed the same kind of temperature range as my SSD's. With that said, I am running my build inside a very large PC Case which has a water cooled CPU and very good airflow and none of my components ever run that hot. 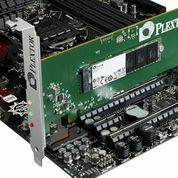 I've found a very interesting article which to my mind adds a lot to the Plextor M.2 PCIe debate. Unfortunately this article isn't full of glowing praise. The first three pages detail the background to the Plextor M6e. It would appear that this SSD is a bit of a compromise. Firstly, to ensure the widest O/S compatibility, the Plextor uses the AHCI protocol. Designed for hard disk drives, the AHCI protocol doesn't support parallel processing of data access requests whereas the new NVMe is optimized for PCI Express and nonvolatile memory. Windows7 only supports AHCI. Windows 8/8.1 supports both AHCI and NVMe. 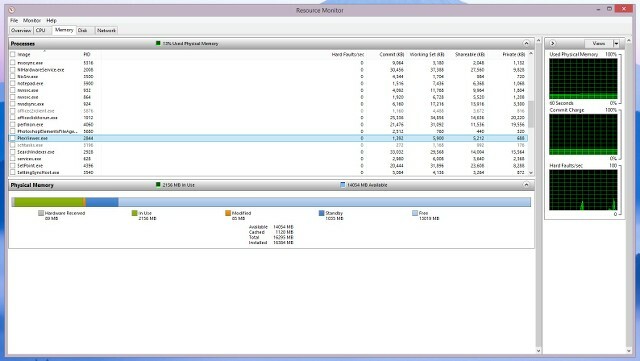 So Windows 8/8.1 users would have greater performance with a M.2 drive that uses NVMe, such as the new Samsung SM951. The M6e specs suggest that simply transitioning an SSD to the PCIe 2.0 x2 bus won’t ensure huge performance benefits without new controllers. 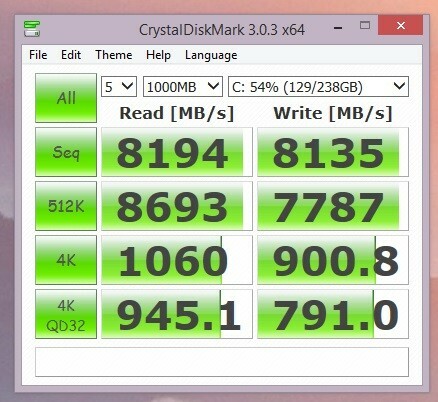 The Marvell 88SS9183 chip is not the best choice for PCIe SSDs, actually. There are faster platforms even from the same Marvell, such as the 88SS9293, but Plextor doesn't seem to be willing to set new performance records. However, if they had used a x4 controller chip it wouldn't have had any benefit over a x2 chip in a native M.2 M/B slot because with the Z79 chipset, Intel purposefully restricted the M.2 native slots to 2 lanes! Basically, what they've done is rather than design an M.2 SSD from scratch, they've adapted an existing design. is going to be faster because there are no intermediary (chipset or switch) between the SSD and the CPU. But the graphics card is going to work in PCIe 3.0 x8 mode in this case on LGA1150/1155 platforms, which may be unacceptable for enthusiasts. The interesting thing is that they found that in read/write tests (especially the random read/writes) the graphics card slot method of connection was the fastest, with the native motherboard M.2 slot the slowest. In real world use, the random read/writes are far more important that the sequential ones, so, to get the best out of this card, one should use it with an adapter plugged into spare graphics card slot. Personally I didn't realise one could do this, nor that it would give the best performance. I'm very surprised that the purpose built motherboard M.2 slot is the slowest of the three. I feel a bit let down actually. But then it's early days still for M.2 PCIe technology. it will improve in the next few chipset generations. They also compared the Plextor M6e (in all three configurations) to a Samsung 840 Pro 256GB, a Samsung 840 EVO 250GB, and a RAID0 array built out of two Samsung 840 EVO 120GB SSD's. I found the final results very surprising. 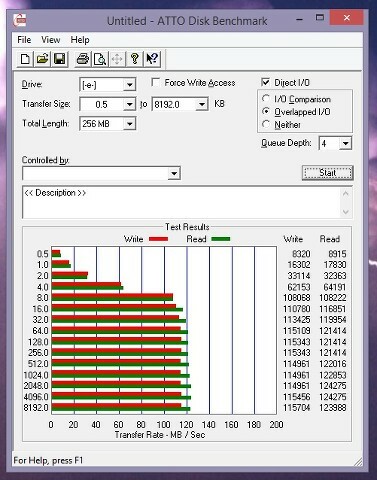 For real world random read/writes a single Samsung 840 Pro is faster and for all out performance, and for sequential read/writes, the Raid0 840 Evo is significantly faster. One other thing this review says is that unfortunately, 2 Plextor M6e's cannot be built into a raid array, although it doesn't say why. Although rather critical about the Plextor M6e, I feel this article has taught me a lot about the M.2 technology and the way Plextor has implemented it, far more than other such reviews. I've also come to realise that for general everyday use, at this point in storage development, it doesn't really matter what type (SATA, M.2, SATA Express etc) or brand of SSD one uses, unless it's a Raid 0 array one isn't going to see that much of a real world difference. A tenth of a second here, maybe half a second there. Not really measurable unless one uses a stopwatch. And if you do want really fast performance, a couple of cheap SSD's is all you need. Of course, this is just one review, people may find their real life experience shows differently. I've also come to realise that for general everyday use, at this point in storage development, it doesn't really matter what type (SATA, M.2, SATA Express etc) or brand of SSD one uses, unless it's a Raid 0 array one isn't going to see that much of a real world difference. A tenth of a second here, maybe half a second there. Not really measurable unless one uses a stopwatch. And if you do want really fast performance, a couple of cheap SSD's is all you need. Whilst I would agree that a RAID 0 Array would be faster, for those who do not have the budget or the desire to go down this route I stand by what I have said earlier. 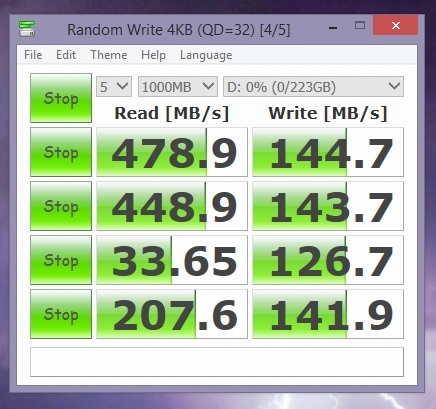 The Plextor M.2 drive is a stunning piece of kit and in my own system performs faster than my standard SATA3 SSD's. I can transfer large video, JPEG & MP3 files (over 10 gigabytes) between my three drives (the Plextor M.2, Corsair Force SSD and ADATA SSD) very quickly, sometimes in under a minute. Even transferring large volumes (over 50 gigabytes) of mixed data to a standard SATA3 HDD via Hotswap connection or USB3 happens much faster than on my Z87 based PC. My whole system is much snappier than previous builds I have done with programs opening much quicker and being more responsive and the only real changes over my last build are the motherboard and Plextor M.2 drive. I am using the Plextor M.2 as the main system drive on a daily basis and this is the first piece of hardware that catches me out, with its speed time and time again. I have to say that, I have noticed a real world difference! I know there are other options available that would be even faster, such as using a more expensive PCIe card but, for most of us mere mortals, the Plextor M.2 is a good option to go for if you are looking for a good speed bump, without the aggravation of setting up a RAID Array. It was instantly recognised by the BIOS and Windows 8.1 installed on it without a hiccup, which is more than can be said for some drives that I have used in the past. The article that you have referred to is not a like for like comparison with my own review and the differences in CPU, Motherboard, RAM, OS, configuration etc., that I used compared to other reviews, will all have a bearing on the results obtained. Yes, there is always room for improvement and hardware manufacturers drip feed us the technology so that we will go out and buy new parts when the next iteration of a device comes along, that is how they make their money. For what it is, what it claims to do and, more importantly, what it actually does on a day-to-day basis I still cannot fault the Plextor M.2 drive. 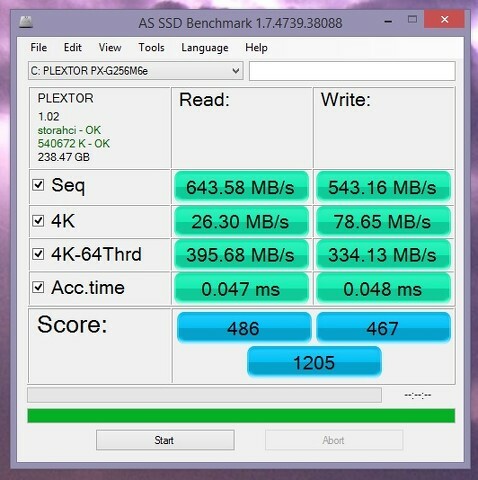 Since I first wrote my review for the Plextor M.2 PCIe SSD, back in June 2014, I have to say that it has performed faultlessly. I have been more than happy with its performance and have been constantly surprised at how quickly my system runs. 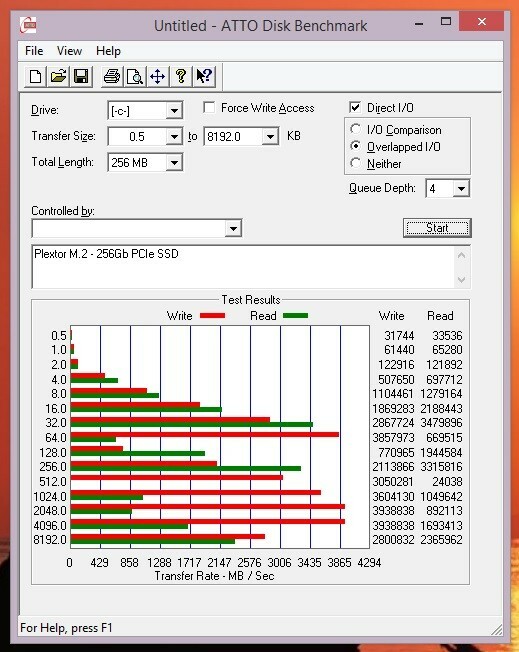 My Plextor M.2 SSD was one of the first released and last night I finally decided to update the Firmware and also to try using the Plextool Software that is available for it. Updating the Firmware was not as straight forward as I had hoped, as it has been a very long time since I had to use MS DOS in BIOS. After creating a bootable MS DOS USB pendrive and loading the Plextor Firmware update I then had to reset the BIOS so that everything was in legacy mode. Once I finally got the system to recognise the drive and to run the Firmware update, everything was pretty painless. I didn't have to disconnect any of my other drives and the Plextor M.2 PCIe SSD was updated without a fault. I reset the BIOS to its usual settings and rebooted then installed the Plextool software. 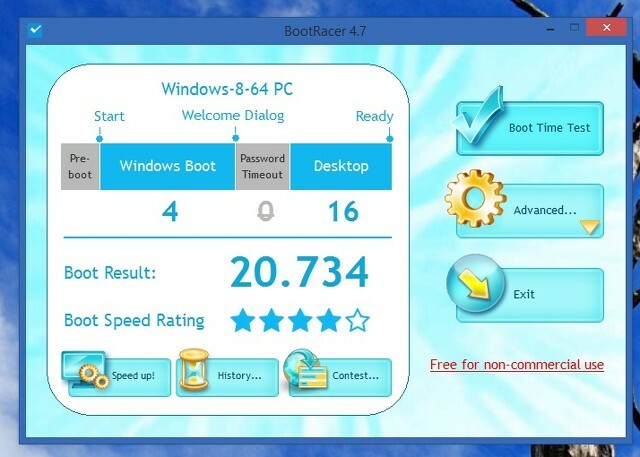 After installation and another reboot I was able to run a few benchmark tests to see how things had improved. The PlexTool Software (Version 1.16) is a neat little program that enables you to run the Turb 2.0 program as well as offering monitoring, secure format, firmware updates etc. of the Plextor drive(s) that you are running in your system. It also includes a diagnostic tool that will check the read/write capabilities of your drive. Plex Turbo 2.0 software is a small program that utilises some of the system's RAM (the amount of system RAM used will vary but, on a system with 16Gb of RAM approximately 3.5GB is used) as a caching buffer, this basically results in faster throughput to and from the SSD. For those worried about the loss of nearly 4 Gb of RAM from their system resources, don't be. The Plex Turbo software only uses this RAM as and when needed, if you are not read/writing to the drive then all but a very small portion (upto 10Mb) of the RAM is allocated back to the system. As in my initial review I ran three different testing programs as each gives different results. Although the results varied between the different benchmarks, overall there is a vast improvement in both read & write speeds being shown from the initial testing back in 2014. But these are only benchmarks and things are always different in the real world. So, is the system really any quicker? The thing is, the Plextool software only kicks in after the OS has loaded and you are at the desktop. There is no impact on the BOOT time. The real advantage comes when you are opening and running programs. Obviously, the faster the information can be read or written back to the drive, the quicker things happen and this results in a snappier system. So, is the system quicker? The answer is yes, everything just opens and responds better than before. There is however one small issue that I haven't resolved yet. The Plextool software runs automatically at startup but the system wants a confirmation for Windows UAC everytime you BOOT into Windows. So, if someone knows how I can get it to auto run, on Windows 8.1 Pro 64 bit, without the UAC coming up I would appreciate the help. Overall this little bit of hardware is still, to my mind, one of the best pieces of kit I have used in a PC build. Yes, there are faster options available, but in most cases these come at a much higher cost. The Plextor M.2 PCIe SSD has taken everything I could throw at it over the past 7-8 months and for that alone, I can't fault it. 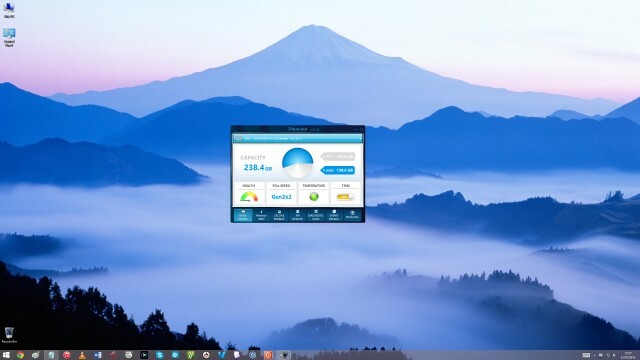 With the Plex Turb feature it has just stepped up a gear and apart from the little niggle with the Windows UAC at startup, I expect this drive to continue delivering the same high speed results it has been doing since it was first installed. Did you find a way around the UAC problems with the turbo thing?